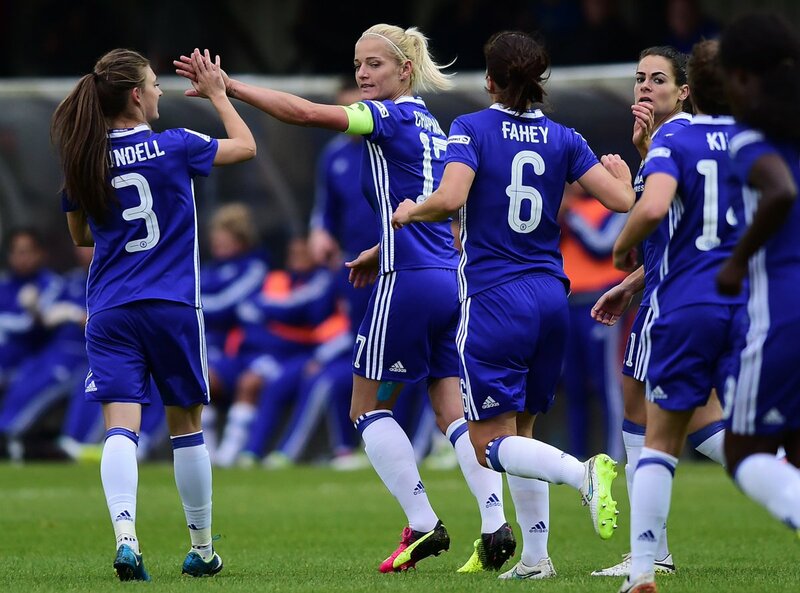 After a lengthy international and maintenance break, Chelsea Ladies are finally back in action this week, travelling up to Sunderland for a(nother) poorly-planned midweek tie, before kicking-off their Continental Cup (league cup) campaign at London Bees on Saturday. The first game is must-win in the title race, while the second is a straight knockout match, with the winner going through to the quarter-finals. The Sunderland match will be a repeat of the tie that closed the first half of the season, a 2-1 result flattering the Black Cats, who faced no fewer than 30 shots from the Blues frontline. Despite the underachieving attack, the three points came at an important time for Chelsea following defeats against rivals Arsenal and Manchester City. Sunderland are still winless in the league, and, while Beth Mead isn’t getting the service she needs to reach her goalscoring heights of last season, the main problem for the Black Cats is at the other end of the field. Defenders Rachel Pitman and Kylla Sjoman both had their seasons ended before they’d even really begun and they are yet to be truly replaced, with young, Development Squad players often having to fill in. Rachael Laws has excelled in goal but has often been left helpless. 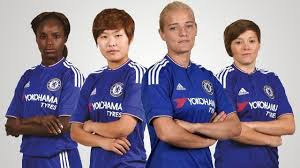 Results this past weekend mean that Chelsea are in the driving seat in WSL1, but will need to continue their attacking dominance from the last time these team met, and find their killer instincts, if they want to take advantage of their games in hand. As a team we’ve beaten 13-0 and 8-0 in previous years, the match against London Bees will likely see some squad rotation, giving opportunities to players such as Jade Bailey, Ana Borges, and Beth England, who have been unable to break into the starting lineups for most of this season. The face most Blues fans will hope to see is that of 17 year old Alessia Russo, who has set the international stage alight but is yet to see time with Chelsea's first team. Personally, the player I'd love to see given a chance is goalkeeper Fran Kitching, who is the third in line, but made her senior debut in the preseason matches against PSG and Bristol City, looking solid in both. If she were to start, it would be her first competitive appearance for the first team. The match also marks an exciting opportunity for fans to see even more Continental Cup action, as our 2pm match will be followed at 5pm by an all-WSL1 clash between Reading and Arsenal. With no signings so far for Chelsea this window, the biggest transfer news was the departure of youngsters Jenna Legg and Laura Rafferty, who will play out the rest of the 2016 season on loan at Oxford United in WSL2. Having both signed professional contracts at the turn of the year, it may be disappointing for the pair to finish their year with just seven minutes for Chelsea between them. However, I am sure that they are very much in the long-term plans for Emma Hayes, and will benefit from not only the first-team experience, but also the responsibility of being leaders in a team with few players of international calibre. On Saturday, four of our loanees faced off in WSL2, with Jodie Brett and Millie Farrow's Bristol City hosting Legg, Rafferty, and Oxford United. Rafferty made her Oxford debut, managing the full 90, whilst Legg did not take part due to an ongoing injury. It was the Vixens who prevailed, Farrow contributing two goals, and Brett pulling the strings in midfield. The most significant WSL result of the weekend was the 1-1 tie between Manchester City and Liverpool. 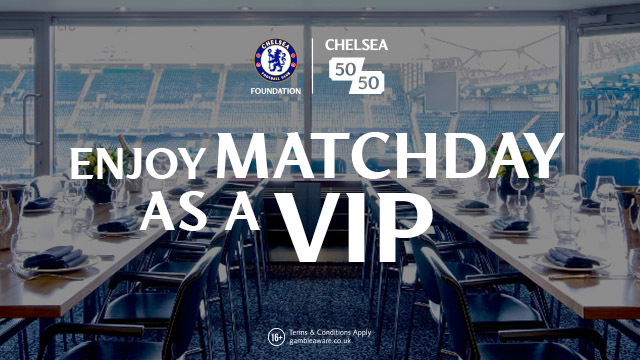 This means that Chelsea now have the advantage, trailing City by five points with two games in hand. Also important to note is that this is the first league goal that Man City have conceded so far this season. Chelsea loanee Laura Coombs started for the Reds. This coming week will see plenty more Loan Watch action, as Bristol and Oxford have midweek league games at Aston Villa and Yeovil Town respectively, before the Continental Cup First Round ties over the weekend. Bristol travel to Sheffield, while Laura Coombs and Liverpool will take on Everton in a Merseyside derby, before Oxford host Birmingham City on Sunday. As mentioned above, the month off was filled with internationals, and we had no fewer than 17 players called up to represent their countries. There was great surprise when Mark Sampson announced his latest England squad, with three long-term regulars, in Eni Aluko, Katie Chapman, and Claire Rafferty missing out. All expressed their intention to return to the international scene, and will have to play the second half of the season with a point to prove. 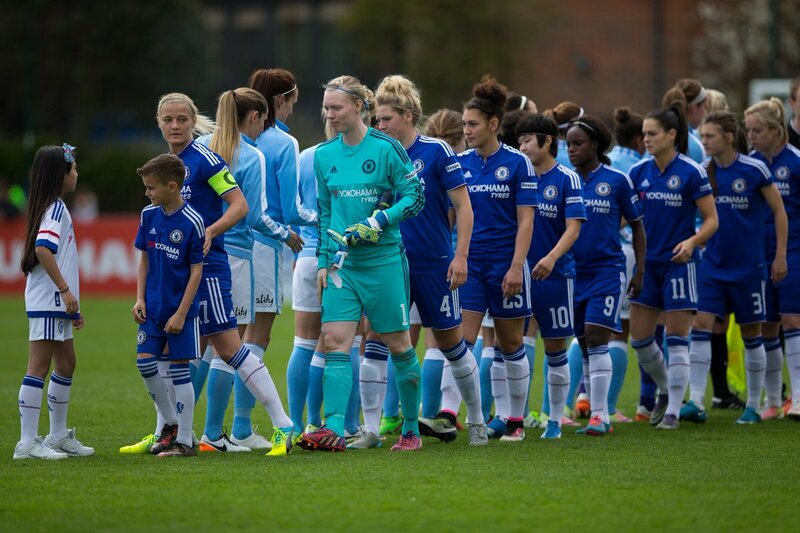 The Blues still had four players in the squad however, in attackers Karen Carney, Gemma Davison, Fran Kirby, and centre-back Gilly Flaherty. Both Kirby and Flaherty were forced out by leg injuries, the severity of which are still unknown. Fran commented that she just had a “small knock”, while Gilly’s was hinted at something more long-term, although nothing was ever confirmed. 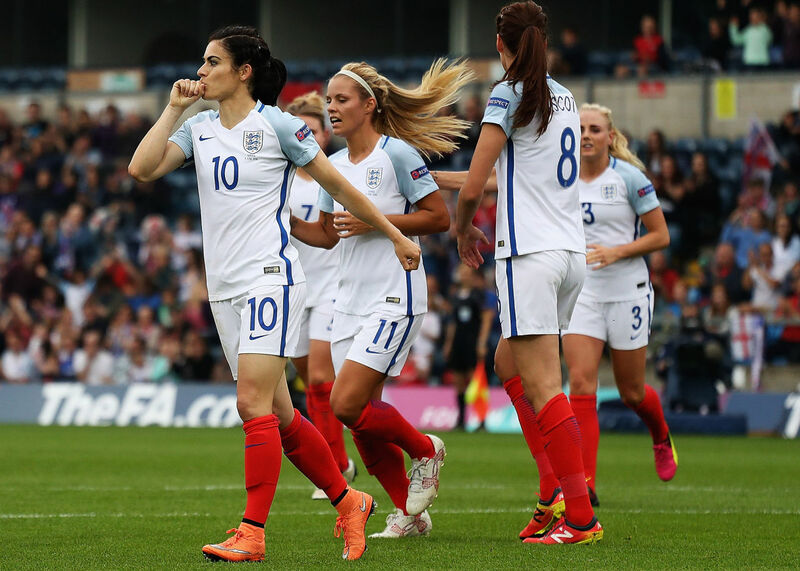 The Lionesses played a home-and-away double-header against Serbia in Euro Qualifying, and stormed to two 7-0 wins. In the home leg, it was Carney who starred, scoring an excellent penalty in the first half, before securing a hattrick in the second with two close range finishes. Not to be outdone, Davison opened her England account with a hattrick, although the third was cruelly taken off her, going down as an own goal, despite already being goalbound. The pair of wins secured England’s berth at next year’s European Championships in Holland. We had two players involved in England U19 action, in Zoe Cross and Jenna Legg. Jenna was unable to play due to an ongoing injury, but Zoe was able to play her part in a 0-0 draw (10-8 win after the 11v11 penalty shootout! ), and 2-0 loss against France at St George’s Park. The Blues had just the seven(!) players called up to the England U23s, where Lilleshall played host to the Nordic Cup. Jade Bailey, Hannah Blundell, Millie Bright, Beth England, and loanees Rosella Ayane, Jodie Brett, and Millie Farrow faced tough opposition in Norway, Sweden, and the USA. Bright was named captain for the tournament, and, along with Blundell, were invited to train with the senior team before the opening matches. Beth put the young Lionesses 1-0 up in the opener, but the Norwegians battled back to 1-1 at full time. Three Chelsea players stepped up in the shootout, and Bright, Blundell, and England all scored in the 4-1 victory. After a 1-0 win against Sweden in the second match, England were left needing a victory against the States in the final game to be crowned champions. Despite the USA taking the lead, Beth England levelled for her namesake team right at the death, and they went on to win the penalty shootout 3-1. But being unbeaten over the three games wasn’t enough, England coming away second to the US on goal difference in a very competitive tournament. Northern Ireland were also in Euro Qualifying, realistically needing two wins to stay in the mix for second in the group. Laura Rafferty didn’t feature in the 4-0 win over Georgia, due to a knock she’d picked up at Chelsea, but trained well and was able to return for the full 90, in a disappointing 3-0 loss in the Czech Republic. Although mathematically still in contention for qualification, they are left needing an unlikely string of results. Ana Borges and Portugal had a pair of positive results, with a 3-0 win in Montenegro, followed by a 0-0 draw with Finland, despite dominating the match. Borges played the full 90 minutes in both games. Portugal are still well in with a chance of qualification, but will need to beat Finland and Ireland in their last two matches. Niamh Fahey and the Republic of Ireland played the same two fixtures - their hopes of qualification ending with a 4-1 loss to the Finns, but that didn’t stop them womping to a 9-0 win against Montenegro, in front of their home crowd. Fahey played the full 90 against Finland, but was suspended for the second match due to the accumulation of yellow cards in the tournament. Sweden were able to qualify for Holland 2017 with little difficulty, Hedvig Lindahl earning a clean sheet in a 4-0 win vs Poland, before being rested for the 6-0 thrashing of Moldova. Katie Startup, goalkeeper for Gillingham and England's U17s, is now registered with the FA as a Chelsea player, and will presumably feature for the Elite Development Squad next season. She will be joined by Hollie Olding, also of England's U17s, who was previously playing for Brighton and Hove Albion, both for the U17s and the first team. 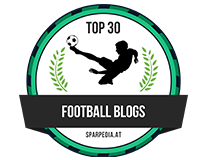 Olding has experience with Chelsea at younger age groups. Brighton have been promoted to next year's WSL2, after winning the Southern Premier League, and defeating Sporting Club Albion in the playoff. No teams are relegated from WSL2, with two going up to WSL1, and one being demoted to WSL2 from the top division. Lizze Durack (Harvard University and England U23s) and Kailen Sheridan (Clemson University and Canada) have both been guests in goalkeeper training with Chelsea ahead of the recent international break.